Migraine headaches can absolutely devastating. When the sufferer is hit by an attack, nothing else will be on his or her mind than to find peace and darkness until the attack is over. Clearly, such attacks makes it difficult to lead a normal work and family life. What are some self-care measures that can offer migraine relief? A number of lifestyle changes can make your migraine attacks occur less frequently, and make them less severe when they do occur. 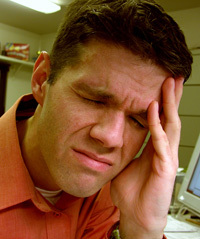 A number of activities, techniques, and exercises that do not require any equipment, such as muscle relaxation, meditation, and yoga, can be help relieve stress. Another idea that will help you relax, is spending at least 30 minutes a day on “alone time”, examples couldbe listening to music, soaking in the bathtub, reading a book. Do what you find most comforting. If you suffer from frequent headaches, it is crucial that you develop healthy sleeping habits. How do you do this? Go to sleep and wake up at regular hours. When you sleep it should be uninterrupted. The amount of hours you sleep should be appropriate, an average adult needs about six to eight hours every night. What triggers migraines differ from person to person. Finding out what triggers yours is crucial in preventing further attacks. How can this be done? It is often recommended to keep a headache diary. As this diary expands, you might be able to pin point what triggers migraines and what helps relieve them. If a headache is approaching, seek rest and relaxation in a dark, quiet room. Place an ice pack, or something similar, on the back of your neck. Finally, try to cautiously apply pressure to spots that hurt using your fingertips. Finally, remember to consult your doctor. Here you can get help preventing further attacks, and help easing the pain of the attacks you do suffer. Did you enjoy this article? If so, visit this page for more advice on a wide variety of topics.